The press has recently been been full of discussion about the publication of Ernst Jünger's War Diaries (Kriegstagebücher), his original notes from the trenches of WWI. Above all this has provided new opportunities for the usual misuse of his works by left-wing opponents and right-wing "friends", respectively expressing their knee-jerk critique and misguided hero worship. The disproportion of this attention is apparent when one remembers that it is directed at a single teenage work of an author who lived to 102, wrote dozens of far more interesting and profound works, and was awarded Germany's highest literary prize. 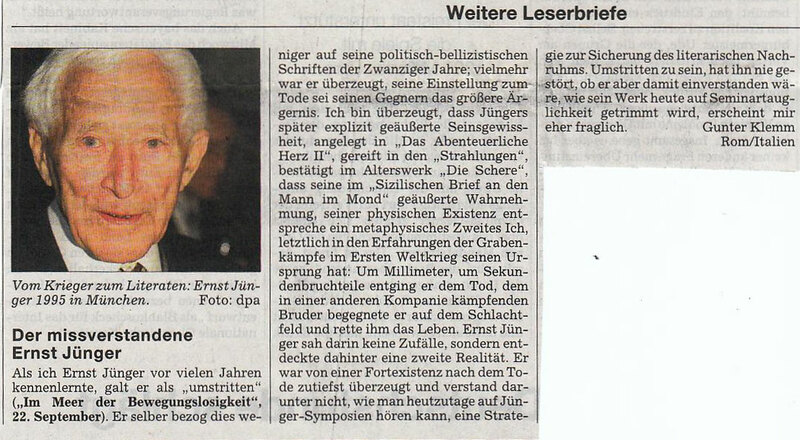 Anyhow...when I came across this letter from a Jünger reader in Italy, I realized I could be as opportunistic as the worst of them and illustrate how even Jünger´s first immature work and its teenage author can be seen in a higher light. 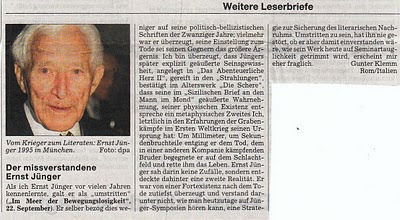 When I first got to know Ernst Jünger many years ago, he was considered “controversial”. He himself ascribed this little to his politico-bellicistic writings of the 20s; he was instead convinced that his attitude to death was the greater problem for his antagonists. I am convinced that Jünger’s later explicitly expressed assurance with regard to Being - as set out in “The Adventurous Heart”, ripened in “Radiations” and confirmed in his late work “The Scissors” - and his perception, expressed in “Sicilian Letters to the Man in the Moon”, of a second metaphysical I corresponding to his physical existence ultimately have their origin in his experiences of trench warfare in WWI. He escaped death by a millimetre, a split-second, and then happened across his brother, who had been fighting in a different company, and managed to save his life. Ernst Jünger did not see a coincidence in this but on the contrary discovered a second reality behind it. He was deeply convinced of a continued existence after death and did not understood by this a strategy for securing posthumous literary fame, as one hears these days at the Jünger Symposium. He was never worried about being controversial, but I do doubt that he would have agreed with the way his works are now trimmed to suit seminars.